The Chevrolet Camaro and Corvette may have a new marketplace competitor in the way of the similarly priced 2020 Toyota Supra, which will start at just under $50,000. Indeed, balance seem to be the focus with this package. The Supra’s turbo inline-six is rated at a satisfactory 335 hp and 365 lb-ft of torque, which is a bit less than many had speculated the Supra would have. Don’t underestimate it though – that’s still enough to take the 3,397 lb Supra from 0-60 mph in 4.1s (helped along by the standard Launch Control system) and on to an electronically limited top speed of 155 mph. Other standard performance goodies include 19-inch alloy wheels, Adaptive Variable Suspension, an active limited slip differential and large 13.7-inch front brake rotors held by 4-piston Brembo calipers. The Supra also features two driving modes: Normal and Sport. The Sport mode stiffens up the active dampers, sharpens throttle response, livens up the differential, makes the exhaust a louder and makes the steering a bit heavier. The new Supra will be offered in three trims from launch: 3.0, 3.0 Premium and Launch Edition (pictured). The base 3.0 trim will come well equipped with dual-zone climate control, keyless entry, power folding mirrors, a leather wrapped steering wheel and a suite of active safety features includes forward collision warning with automatic emergency braking and lane departure warning with steering assist. Prices will start at $49,990 in the US before destination and taxes. Loaded Launch Edition models will retail for $55,250. 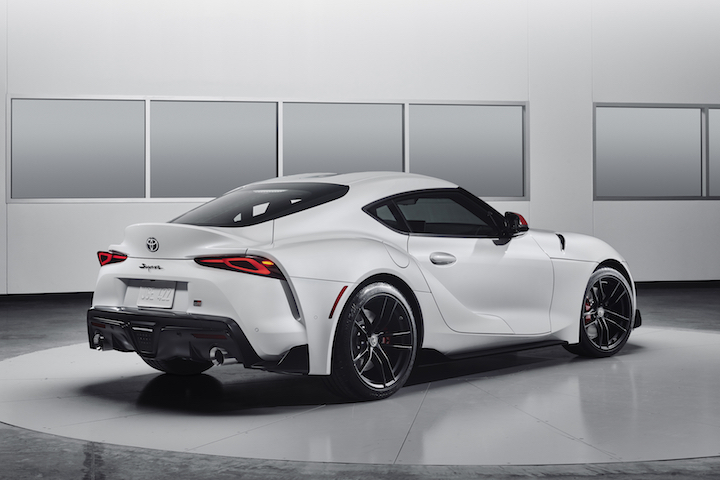 The 2020 Toyota Supra does not outgun the Camaro SS in performance, nor does it represent better value for money than something like the Camaro 1LE V6. It’s cheaper than a Corvette, but has much less power on tap. We doubt many Chevy fans will be wooed away from their Camaros or Corvettes by the Supra (this is a car to appease the Toyota fans and Supra fans, after all), but it’s always interesting to see more two-door sports cars enter the market. Feel free to let us know what you think of the 2020 Toyota Supra in the comments below. Also, be sure to check out our past GM/Toyota news. As nice a product as this might be, I am a purist. I don’t like the idea of a “Toyota” with a BMW engine and developed largely in Germany by the Bavarian carmaker. That’s not a real Toyota and certainly not a true Supra. One thing is obvious though, it was styled in Japan so the design is way over-the-top and disjointed. I’ll take the real deal and much more elegant Zed-4 any day. BMW’s have good hardware (body, powertrain,etc) but are very problematic in software (electronics) therefore not a good quality. I like the exterior, I don’t like the lazy BMW interior (although the red accents are nice). Looks are definitely not the strong point of this car, I’d pick even facelifted camaro over this. This is the same thing as the Toyosubaru F86whatervertheeff. Fanboys want it, but when it comes to putting cash on the table……they never show up. This will sit alongside the GTR, the 4000 year old 370Z and the new NSX in the Parthenon of over ratted Japanese sports cars. New Supra isn’t like before, it is two seat. I really think it’s real C7 Corvette rival. Without any of the power or styling or V8…..yep, totally. I really think its a lazy dupe trying to cash in on Playstation F&F fanboys with an ugly re-style of a BMW REBADGE. i think you are going to need an ample supply of pipe cleaners to wash it correctly. Real question is why build this car when it isn’t superior to either the Camaro or Corvette; it might have been different if Toyota went off script and the Supra was a mid-engine twin-turbo 3.0L V6 with electric hybrid boost to take a shot at Chevy’s upcoming C8 Corvette. Its amazing that it took 2 whole companies working together to produce something this ugly, slow and overrated and dull dull dull dull. It’s not the first time the axis powers put there heads together. BMW supplied Japan with engine specs for planes in the imperial army and navy during WW2. The 2020 Toyota Supra specs is good enough. It’s all about looks. If it looks good, then it must be good. Definitely a market disrupter. Well this is the future for many sports cars of low volume. We see it here and we saw it with the Miata and Fiat. The volumes are so low and the development cost are so high there will be few pure sports cars outside Corvette and Porsche. This car is more a Cayman challenger than anything from GM. Few would ever cross shop these. Much like the Fiat Mista they took a decent looking car and did it no good. This will be another Toyota sports car that will sell for 5-8 year and will vanish to the halls of obscurity. We see it time and time again. Just look at the GTR. Lots of press but few on the streets and today mostly forgotten. Disagree. They probably neutered the power to save room for a high performance variant in a year or two. I bet this will handle well on a track and will be rev happy. Now I know how Toht and Belloq must’ve felt. I don’t care what people say about the looks or power, I’d love to wake up to one of these for my morning commute. And at about $10k less than an entry automatic cayman or vette it’s not too bad. Would take this over an M2 any day. No fan of the outside. Way too tatted up and busy. The demographic that buys this will be interesting to see. In this day and age I honestly don’t think anyone needs to look outside of the big 3 for performance, luxury and status or even the combination of all three. The Camaro has always been a nice bang for the buck, the current generation is still that and so much more. It’s truly remarkable how good this current generation of muscle cars really are. That grumpy cat faced rear end gives me something to laugh at while being underwhelmed by performance. I am curious to see what the aftermarket does for it though, I’m sure some big companies will have more fun with this platform than they did with the GTR. I hope to see some sweet Dyno queens making 1,000+ horsepower. Eeew gross. Toyota lays another turd on the landscape. Ill stick with my usual suspects for pony car fun the Stang, Camaro and Chally. The concept looked better, but if it drives half as good as it looks (and it does look good, despite what the tasteless lot of you triggered fan girls say) it’s going to be a fun car. Fifteen years from now when you can buy a used C7 for under $15,000 these will be selling strong at or near MSRP, if not higher. Before I even read the article, I thought it looked like a Z4. I suppose it would be hard to make it look distinct enough to break the connection. I’ll reserve final judgment until I see in person at the Chicago Auto Show. Right now, I’d spend my money on the Camaro still.